Most of us know that it's dangerous to leave a dog (or any other pet) in a parked, un-airconditioned car, but apparently not everyone out there is quite so sensible. Yesterday two girls left their puppy alone in a parked car (windows up, no water) right outside the PetRelocation.com office in downtown Austin, TX. Since the temperature was a steamy 89 degrees and the girls were clearly going to be gone for awhile (they paid for an hour on the meter), we knew we had to do something. Long story short, after just a few minutes we called the Downtown Rangers (and then the Police were summoned as well). They released the lock and opened the car, we gave the thirsty pup some much-needed water, the girls were phoned, and they eventually returned to the scene and were reprimanded (but not ticketed) by the police.The dog was fine but we were mad. Do people really not know that it's wrong to leave your dog in such conditions? Unfortunately careless pet owners are probably not going to read our blog, but for the record, here's how to take good care of your pets while driving around this summer, as well as some advice for what to do if you run into a situation like we did. 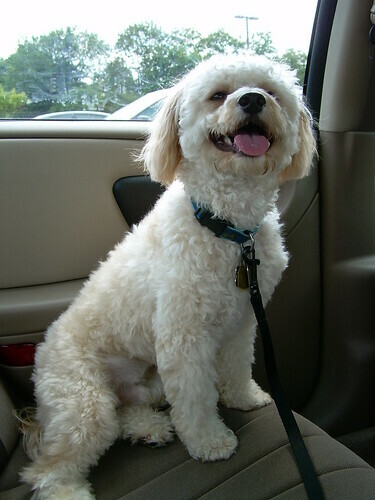 -Never leave your dog in a parked, un-airconditioned car for more than just a moment. If the temperature is reasonable (below 70 degrees Fahrenheit) and you do have to, park in the shade, leave the windows down and provide some water. -If you're out running errands in the summer, don't bring your dog. -If you're traveling with your pet during the summer and need to stop, bring pets out of the car with you or leave them inside with someone with the air conditioner still running. -Cars heat up quickly and heatstroke can be fatal, so always use your best judgment and err on the side of caution. That should take care of most of the problems, but if one of those less-than-stellar pet owners out there leaves their pet in a risky situation, what should you do if you come across it? We asked the police officer who helped with yesterday's predicament, and he said calling the police is the right thing to do. Every state has different laws regarding animal welfare, but much of the time police officers and animal control workers have the right to enter a car, release a lock, or even break a car window if an animal is suffering inside. A person may not keep an animal in a motor vehicle or other enclosed space in which the animal's health or life is endangered by high temperature, low temperature, or inadequate ventilation. A peace officer or animal control officer may, after attempting to locate the animal's owner, remove the animal from a vehicle or enclosed space using any reasonable means, including breaking a window or lock. If professional services are required to remove the animal, the owner is responsible for the cost. Again, laws may be different in your state but they probably resemble the guidelines above. Above all, if a pet's life is in danger, you have every right to contact the authorities and notify them of the situation. Have you ever run across a dog stuck in a hot car? What did you do? Take a look at these safe summer pet travel tips as you prepare for your summer adventures, and contact PetRelocation.com with any questions you have. Don't leave precious cargo unattended!